This is the first knife I've made using 15N20 as the blade steel. 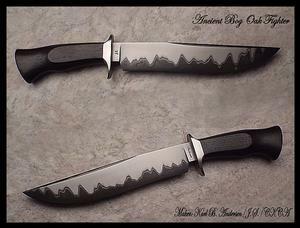 15N20 is the nickel bearing steel we often use in our Damascus. But since it mostly comes in very thin dimensions, it is not frequently used as a "stand alone" blade. However, with the guidance of Master Smith Ray Kirk, I have learned how to forge weld with kerosene as a flux, which leaves no weld lines or weld junctures. In essence, this leaves a perfectly homogeneous piece of steel. Preliminary testing shows this to be a very tough and effective cutting instrument. The guard is 416 stainless steel and the take-down handle is constructed of Ebony. 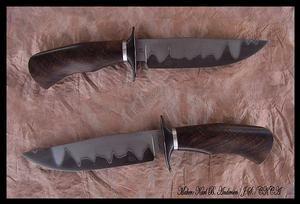 This will be one of the knives I am taking to the 2013 Atlanta Blade Show. Interesting piece of material here - Ancient Bog Oak. The San Mai blade is made of 1095 for the tool steel core, and 420 stainless for the outer jacket. 416 stainless steel was used for the guard. 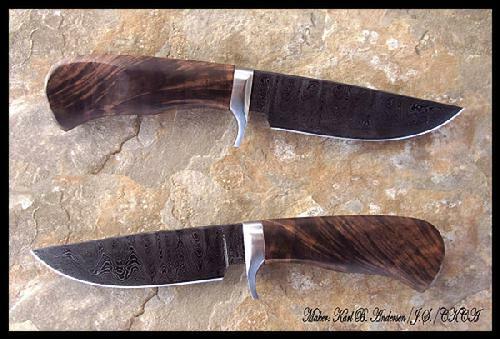 A very stunning piece that would make a great entry knife into beginning your Andersen Forge knife collection! I think I can pretty much just let this knife speak for itself. 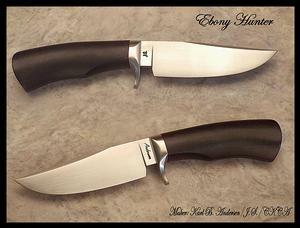 Simply a beautiful combination of materials all throughout this knife - including the Scott Teaschner Sheath!! This detailed tooling and scroll work from Scott just really sets off the whole package. 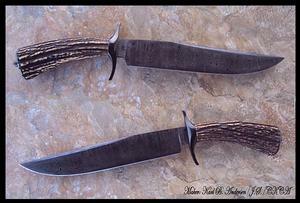 The loosely laddered and hot blued Damascus is 1095 and 15N20. What I call "feather" walnut has been professionally stabilized. Stainless steel take-down fittings complete the ensemble. This li'l beauty was made from a billet of 1095 and 420 stainless San Mai. I have just recently discovered my preference of 420 over 416 stainless for the San Mai "jacket". I need to be honest here and say that this is one of my favorite knives in my career. I just happen to like everything about it. It seems as if each of the components compliment the remainder. I'm pleased to post it here. Quite a little specimen here. This is what I refer to as a "Pack Knife", due to its size. Big enough to handle some decent camp-type chores, small enough to wear either on your belt or toss into the back pack/portage pack. And small enough to perform some detail work. I made this blade from a billet of 1095 tool steel with a "jacket" of 420 Stainless steel to help reduce some of those potential stains acquired while in the wilderness!! The handle is a piece of Stabilized Franquette Walnut, which is a rather rare sub-species of the Walnut family from France. Not many of these were ever planted in the United States in Northern California. Just absolutely spectacular figure in this material. I'm pleased to offer it for sale to my discriminating customers. Just a sweet little delicate belt knife that was influenced by two good friends of mine. They wanted a knife to wear on their belts that was so light they didn't even know they would have it on! 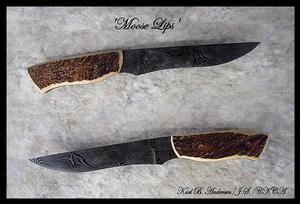 This is the first one and was handled with Minnesota Moose antler scales. 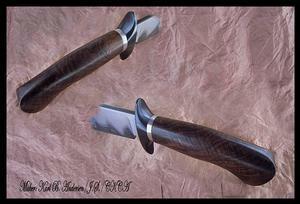 A really nice blade of hot-blued Twist Damascus should offer great opportunities for detailed big game chores.